No, I don't sell pianos! But I can help you make the right choice for your situation. The purchase of a piano is a complex and expensive proposition, but all too often, non-musicians leap into this major purchase without professional advice. Such informed guidance can be invaluable in preventing problems and disappointments in years to come. I will be happy to help you, whether you are seeking a new or a used piano, and in many cases there is no charge for my services, which include a trip to the store or other location. WHAT IS A GOOD PIANO TEACHER? Harry, Claire, Christine, Katie T, and Kevin C. at "101 Pianists"
Click for video of Harry, age 11 and Katie T, age 8 interviewed at the Lang Lang "101 Pianists"Program at the Tilles Center, 2014. Interview is at 1:22, with images at 1:09 and the very end. 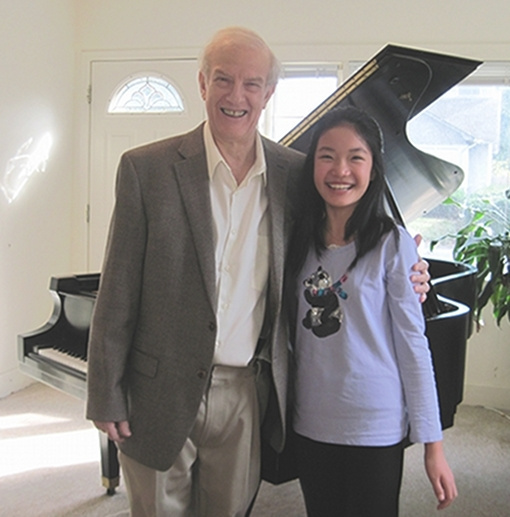 See Lawrence Schubert Piano Instruction on Facebook. Join Facebook free of charge and click to "like" my page!